Applications are now being accepted from Washington artists and crafters to participate in the 2018 Crafts Day at the Lake Forest Park Farmers Market, which will take place on Sunday, July 15th. Artists and crafters of all kinds are encouraged to submit applications for consideration. 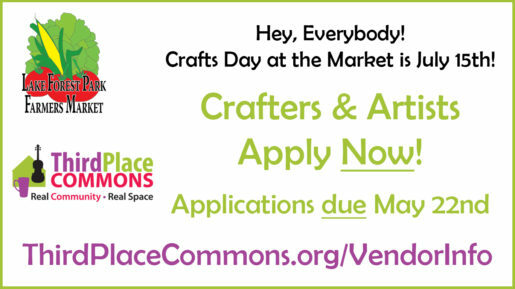 Please visit the vendor info page and review the Crafts Day application carefully for full details. All applications must be submitted via postal mail and received no later than Tuesday, May 22nd. All items presented at the Crafts Day must be handmade in Washington by the individuals selling at the market. The market seeks to reflect a wide variety of media to represent a broad spectrum of creative endeavors, so submit your applications soon! Previous Post: What a wonderful day at the Commons! Next Post: GiveBIG NOW! Support What You Love at the Commons!